While most of the European World Cup racers have returned to their home countries, we have staked out our own home-away-from-home in Inzell, Germany. One of our wax techs has a family connection to the Rauschbergblick Gasthof so the team often comes and stays here when there are breaks in the competition schedule. There is over half a meter of snow and the skiing is amazing! Tomorrow we are shooting at the World Cup venue in Ruhpolding, which is the next town over. We are here until next Tuesday, when we'll depart for Nove Mesto, Czech Republic for our next weekend of races. Here are a few pictures from Inzell. Me skiing in the sun! I am headed to Nove Mesto, Czech Republic and Oslo, Norway for World Cups 7 & 8! 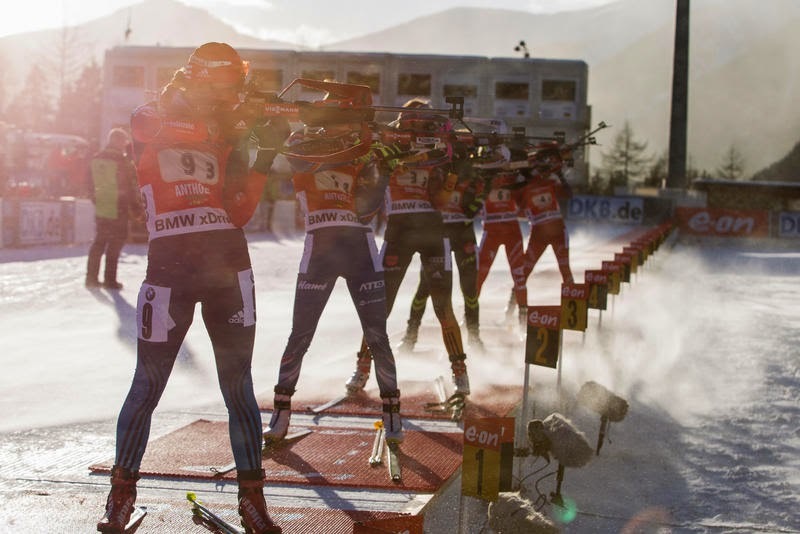 Here is a link to US Biathlon's official press release. I finished my first World Cup biathlon race! I was the 4th leg of our relay team at World Cup 6 in Antholz, Italy. In the women's relay event, each person skis a 2k loop, shoots prone, skis another 2k loop, shoots standing, and then skis a third 2k loop and tags off. For each shooting stage, in addition to the five bullets ("rounds") in the magazine, you have three spare rounds you can load by hand if you need to. If you still have un-hit targets after using eight bullets, you have to ski the corresponding number of penalty laps. Spare rounds and penalty laps take a lot of time so it is best to try to hit all five targets on the first pass! In a typical biathlon race, the top teams have no penalty laps and few spares. On Sunday, however, there was strong gusting wind, and only one team out of 20 finished the race with no penalties. For anyone who is trying to decode the results: Clare Egan 0+3, 2+3 means I used all three spares in prone but did not have any penalty laps, and then used all three spares in standing and still had two penalty laps. Susan Dunklee went first for our team. She shot 0+0, 0+3 (get it??) and skied the fastest ski time for the first leg, tagging off to Hannah Dreissigacker in 2nd place! Hannah shot 0+2 in prone but then got stuck on the range during a gale-force gust in standing and shot 3+3! She was on the range for almost two minutes, along with about ten other women, just waiting for the wind to die. A normal range time is more like 30 seconds. Hannah tagged off to our third skier, Annelies Cook, in 12th. Annelies shot 0+3, 0+1 and skied us up into 10th place, when she tagged me! I was psyched that I was keeping up with other skiers around me on my first loop. In prone I missed my first three shots! But then I hit my last two, as well as all three spares so I avoided going into the penalty loop. In standing, the opposite thing happened. I hit my first three shots, but then missed the next five, and had to go twice around the penalty loop. I was lucky when I first arrived on the range it was calm enough for me to get those three shots off and have hits. Then after that the wind picked up again and I couldn't control the rifle. My last lap was hard, because I was alone on course. All the teams behind us had been lapped by the leaders so they were pulled out of the race and not allowed to finish, and all the spectators were already leaving. When I finished, my teammate Susan was waiting for me at the finish line and showed me where my warm clothes were and carried my stuff for me. Thank goodness for good teammates! The whole World Cup experience was very positive and I am looking forward to racing at World Cups 7 & 8 in Nove Mesto, Czech Republic and Oslo, Norway. I think that I will fit right in. Me in the finish area, as seen on Eurovision live feed, by my dad in Florida! "Biathlon Fans Hungary" are also fans of USA! 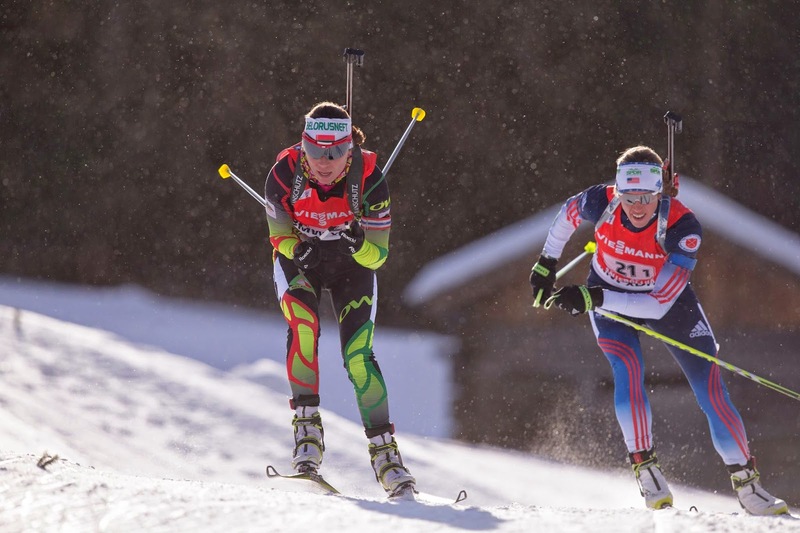 Here is a link to FasterSkier's article about Sunday's 4x6k women's World Cup relay in Antholz. 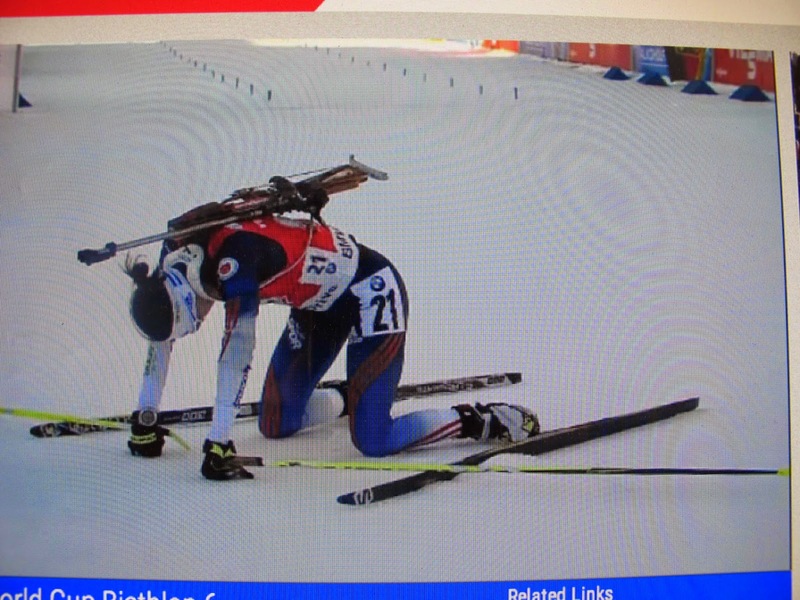 Here is a link to US Biathlon's official recap from today. I will write my own in the next few days! Check out this story on Maine Public Broadcasting Network about my first trip to the World Cup. You can listen or read the transcript, here. World Cup 6 is underway in Antholz, Italy. With the exception of a handful of dedicated friends, I believe this is the first time in my life that anyone outside my immediate family has come to watch a race. There were spectators lining the course already on Tuesday to watch us train. Now that the races are underway, the stands, biergartens, and trailsides are packed. I usually think of cross-country skiing as a quiet sport, but here the air is full of sounds: noisemakers and screaming fans everywhere, hilarious live Tyrollean accordion music amplified from a bandstand, announcers talking in German and Italian, and of course gun shots. There are several jumbo screens around the stadium, TV cameras out on the course on moving tracks and even one hanging from a huge crane, and people all dressed up in funny hats and facepaint waving banners and flags for their favorite teams and athletes. It's a big party. I already signed a bunch of autographs and posed for pictures...and I haven't even competed yet. I just learned from my coach that I will be doing my first World Cup this weekend! I will be in the 4x6k women's relay on Sunday in Antholz, Italy. My teammate Maddie, who was also named to the World Cup for this weekend, will compete in the sprint on Friday and have a chance at qualifying for the pursuit on Saturday! (See my previous post for a more in-depth explanation of all of this.) Check out the venue and the event site, here! They are expecting more than 60,000 spectators! "Also on Saturday, U.S. Biathlon announced additional athletes for upcoming international competitions. 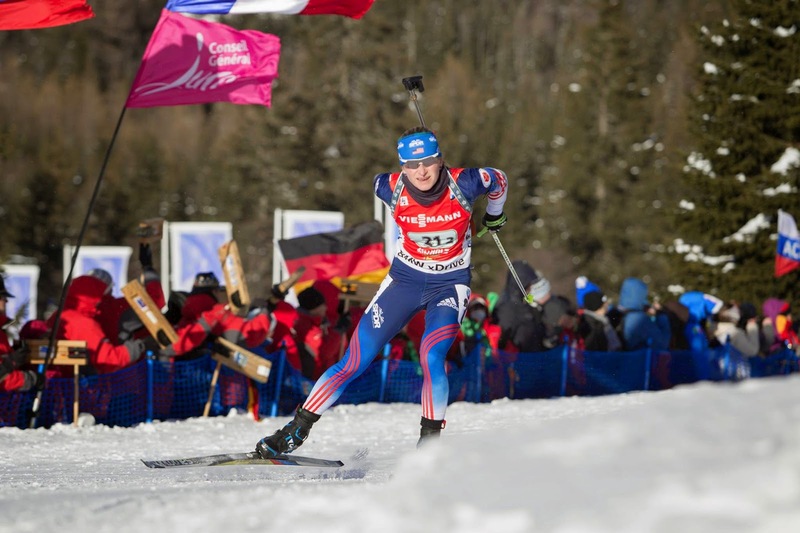 Joining the women's team for IBU World Cup 6 in Antholz, Italy, Jan. 22-25, will be Maddie Phaneuf (Old Forge, N.Y.) and Clare Egan (Cape Elizabeth, Maine), while Russell Currier (Stockholm, Maine) will join the men's team for that event. Phaneuf and Currier will also compete at the Open European Championships, Jan. 27-Feb. 3 in Otepaa, Estonia, along with Doherty, Nordgren and Casey Smith (Winthrop, Wash.)." Patience on the Fast Track! So what now? Based on the results from two weekends of IBU Cup racing, the national team coaches decided to bring both Maddie Phaneuf and me to World Cup 6 in Antholz, Italy. We will join US Biathlon Team veterans Susan Dunklee, Hannah Dreissigacker, and Annelies Cook. The US is allowed to start four women in any given race, so Maddie and I will probably each get one chance to compete. There is a sprint on Friday, from which the top 60 finishers qualify for the pursuit on Saturday, and then there is a relay on Sunday. Maddie and I are the only two female members of the US Biathlon "X Team." 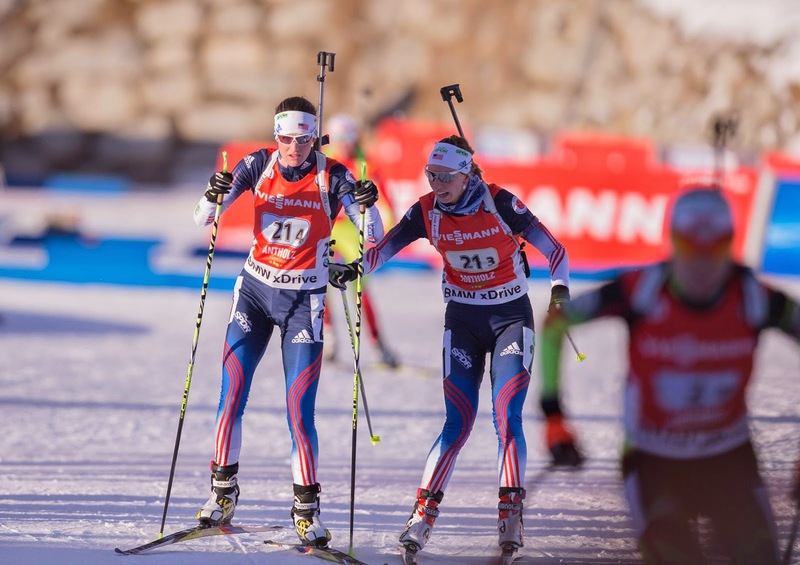 She is one of the top shooters in the US of any age, and one of the best biathletes in the world for her age: last year she placed 4th at World Junior Biathlon Championships. She is only 19 so she is focussing on preparing for another World Junior Championships this year, but she is also getting a taste for the World Cup. After racing well at IBU Cup 4 in Poland, she made her World Cup debut last week at World Cup 5 in Rupholding as a part of the women's 4x6k relay. Since Maddie is so reliable on the range, it is likely that the coaching staff will choose her to fill the 4th spot on our relay team again this Sunday. I may be given the opportunity to compete in the sprint, where, if I had the race of my life, based on my ski speed I could have a chance to make the pursuit. So my World Cup debut could come as early as this Friday. I am keeping super high goals and super low expectations: try to make the pursuit, but don't think twice if I finish in last place! My outlook for this sport goes beyond this weekend or this season, so every race is good practice for next time. My coaches are putting me on the "fast track", giving me as much experience as possible at the highest level, and I am just trying to keep up. Of course I am trying to get better as fast as I can, but it just takes time. My first biathlon coach, Algis, said, "How to do you think you get better at standing with a rifle? Standing with a rifle!" People like me, whose lives revolve around trying to do something as fast as possible, are not often patient. Those who are make great biathletes! My coach, Jean Paquet, and I at Lago Dobbiacco. Snow and sun in Ridnaun, Italy! The olde proverb goes: biathlon giveth, and biathlon taketh away. Yesterday at my second IBU Cup, biathlon gaveth! I hit all 10 of my targets. I had never hit all my standing targets in a race before, so to do that on a day when I also hit all my prone targets was pretty special. And do to it on a day when I really needed to-- for my own sanity as well as my goal to qualify for the World Cup-- meant even more. I came in 32nd, struggling to ski fast after being sick last week. But the ski speed will come back sooner or later, and in the meantime I qualified for the pursuit, which was my result goal for the day. I also finished within 15% time back from the leaders, which means I met the IBU's qualification standard for the World Cup. I am learning that succeeding at a high level in this sport, or probably any sport, really takes a village. There is no way (seriously, NO WAY) I could have turned around after last weekend's debacle and performed well this weekend without all the help I received from coaches, teammates and friends, some of which I mentioned in my previous blogpost. I am racing in the pursuit today. I am going to try to do all the same things I did yesterday. I also need to try not to get lapped, because if I do I will get pulled from the race and will not be allowed to finish. It is humbling to race with all of these really strong and talented women! Here is the link to results from the sprint. My first IBU Cup race was not at all what I had in mind. Even though I was just starting to get over my cold and had only practiced once all week, I decided to race last Saturday because participating in the IBU Cup is such a big opportunity for me. But my ill-preparedness (and I mean ILL) showed: I got almost last place- 77th out of 83, hitting only five out of ten targets, clocking the 66th fastest course time and the 81st fastest (third slowest) shooting time. I am hopeful that this will go down in history as my most fantastically bad biathlon personal-worst, along with that one time I got third-to-last in a nordic Eastern Cup. Needless to say, my IBU Cup debut performance did not earn me starting rights on the World Cup. But I will compete again this weekend in Ridnaun, Italy and I hope that as a healthy athlete I can do significantly better and maybe earn that World Cup start. In the meantime, I got some positive perspective from the experts. Susan Dunklee said that even when she has a minor cold she notices a drop in her shooting percentages. Shooting requires fine cerebral and physical work, so trying to perform well when your mind and body are even slightly under-responsive is extra challenging. "Head up and keep fighting" was another piece of wisdom from Susan, one which I know she lives by. Lowell Bailey reminded me that you have to play to win! He said that about his own race from last weekend, in which he too hit only half of his targets and finished 30th out of 30 in a really tough day on the World Cup. This is a guy who has been to the Olympics multiple times and stood on the World Cup podium. And Hannah Dreissigacker shared her own first-IBU experience with me: she apparently missed "a bazillion" targets (that's gotta be at least 50%) one day, and cross-fired onto the wrong target the next. With the pressure of qualifying for the World Cup off her shoulders, she was able to look at each of her subsequent races as an opportunity for success rather than a chance at blowing it, and that's when she started racing to her potential. Later that season she made her World Cup debut. Sean McAnn, who works for the US Olympic Committee as a sports psychologist for precision shooters and biathletes, asked me, "What is your job?" My job is to perform well. Qualifying for the World Cup, or winning a medal, or whatever the result goal may be, comes as a result of performing well and not the other way around. So what are my keys to shooting well and skiing well? That is my homework for the foreseeable future! I'm so grateful to have all these smart and experienced people to help me keep my head on straight. Maybe their wisdom will infiltrate your outlook and help you perform well, too. I got my first Team USA uniform this week! This is my first time representing the USA and I am very proud. Racing and Not Racing in Europe! Today was my first race in Europe! ...and I sat in my hotel room sneezing. I got a cold after Christmas and fought it off twice and re-got it again three times. The third time coincided with my international travel and now I am really run down. I have taken the whole week off since arriving here, but plan to race tomorrow, as I have only this weekend and next to race on the IBU cup and potentially qualify for the World Cup. Here's how qualification works: I am here with two other American women. Based on our results from these two weekends of IBU Cup racing, the top performer among us will move up to the World Cup and compete in Antholz, Italy at World Cup 5, and perhaps beyond. The other two will train for a week in Italy and then travel to Estonia for European Championships. Right now I am trying to focus on getting healthy, but I need to compromise that tomorrow in order to have a chance at making the World Cup! No athlete likes to make a decision that is contrary to the best interest of her health, but no athlete likes to sacrifice her big opportunity either! This is the first time I have missed a race due to illness, and I hope it is my last!! !